Jock Boyer, the first American to race in the Tour de France, spent the last six and a half years training Rwanda's national cycling team on the roads and paths that fan out from the northern city of Ruhengeri across the Land of a Thousand Hills. Under Jock's tutelage, team members qualified for international competition and became an inspiration for a country deeply scarred by genocide. The team’s inspiring story is chronicled in a new documentary called 'Rising From Ashes,' but Jock insists that the local cyclists' success is best understood in the context of his adopted nation's striking landscape. 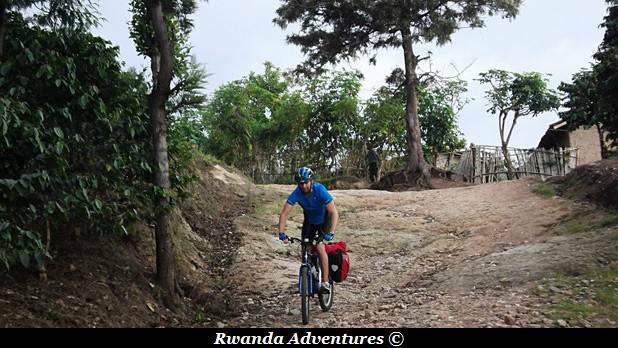 "I just want to get people to explore and experience Rwanda on a bike," he says. "It's good for everybody." He suggests that adventure travelers eschew safaris in favor of rides, specifically his favorite mountain and road routes. A straight 40-mile shot south from the capital of Kigali down the Kigali-Nyamata Road to the Burundi border, this moderate trek follows quiet, well-maintained, and lightly trafficked asphalt over low, rolling green hills dotted with banana plantations. Some 30 miles out, stop near Nyamata at the memorial site, a church where some 2,500 Rwandans were killed during the genocide. You’ll want to overnight just south of Nyamata, where a left turn puts you on a dirt road leading to the village of Gashora and the Rwandan version of the lakes district, where nine bodies of water pool out from the Nyabarongo River. Stay at the 52-room La Palisse Gashora on bird-friendly Lake Rumira, just one mile from town. Tempting as it may be, bikers probably shouldn't cross the border. Burundi remains unstable after years of civil strife. Snaking south from the city of Gisenyi in Rwanda's far northwest, the Congo Nile Trail follows the undulating eastern shore of 915-square-mile Lake Kivu, which doubles as the Congo border. This moderate dirt route, opened in late 2011, covers mountainous green terrain and takes riders past coffee and tea plantations. Tired bikers can take a dip in the lake's temperate hippo- and crocodile-free water. Rwandan Adventures offers a week-long 100-mile tour of the trail (from $2,550, including return boat ride) ending in Cyangugu in the west, stopping at the Muslim market village of N'Kora, the L'Esperance fruit farm and orphanage in Kigarama, and sometimes Nyungwe National Park, where pedalers dismount to track chimpanzees. More information: KLM flies regularly to Kigali from Amsterdam's Schiphol International.